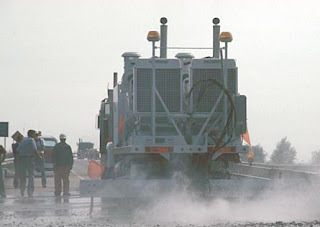 Some years ago we were on a bridge in Michigan, working on a demonstration of the ability of high-pressure jets to remove damaged concrete from the surface of the bridge. Before the demonstration began the state bridge inspector walked over the bridge armed with a length of chain. He would drop the lower links of the chain against the concrete at regular intervals, and depending on the sound made by the contact, would decide if the concrete was good, or not. He then marked out the damaged zones on the concrete, and suggested that we get to work and remove those patches. The change in the sound that he heard, and used to find the bad patches in the 1concrete, was caused by the growth of cracks in that concrete. It was these longer cracks, and delaminations in the concrete that made it sound “drummy” and which identified it as bad concrete. Now here is the initial advantage that a high-pressure waterjet has in such a case. The water will penetrate into these cracks. As I mentioned in an earlier post, water removes material by growing existing cracks until they intersect, and pieces of the surface are removed. The bigger the cracks in the surface, the lower the pressure that is needed to cause them to grow. This is because the water fills the crack, and pressurizes the water, the longer the crack, the greater the resulting force, and thus the greater the ease in removing material. 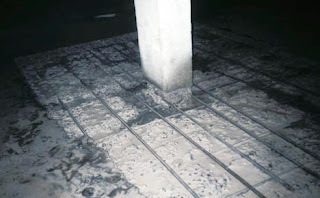 At an operating waterjet pressure of between 11,000 and 12,500 psi, for a normal bridge-deck concrete, the cracks that are long enough for an inspector to call the bridge “damaged” will grow and cause the damaged material to break off. The pressure is low enough, however, that it will not grow the smaller cracks in “good” concrete, which is therefore left in place. Figure 2. Damaged area of bridge after jet passes. In order to cover the bridge effectively and at a reasonable speed, six jets were directed down from the ends of a set of rotating crossheads, within a protective cover. The diameter of the path was around 2 feet, and the head was traversed over the bridge so that it took about a minute for the head to sweep the width of a traffic lane. Figure 3. Scarifying jets, with the head raised above the deck so that their location can be seen. Normally the nozzles are positioned just above the deck, so that the rebounding material is caught in the shroud. Unfortunately, while this means that the rotating waterjet head could distinguish between good and bad, and remove the latter while leaving the former, it could not read marks on concrete. So where the bridge inspector was not totally accurate, the jet removal did not follow his recommendations. It was, however, quite good at removing damaged concrete from reinforcing bar in the concrete, where the water migration along the rebar had also caused the metal to rust. And, since the pressure was low enough to remove the cement bonding, without digging out or breaking the small pebbles in the concrete, they remained partially anchored in the residual concrete. As a result when the new pour was made over the cleaned surface, the new cement could bond to the original pebbles, and this gave a rough non-laminar surface, which provided a much better bond than that left had the damaged material been removed mechanically with a grinding tool. Figure 4. Rebar cleaned by the action of the jet as it removes the surrounding damaged concrete. Waterjets had an additional advantage at this point in that, in contrast with the jackhammer that had previously been used to dig out the damaged region, but which vibrated the rebar when it was hit, so that damage spread along the bar outside the zone being repaired, with the jet action there was no similar force, so that the delamination was largely eliminated. Now this ability to sense and remove all the damaged concrete is not an unmixed blessing. Consider that a bridge deck is typically several inches thick, and it is usually sufficient to remove damaged concrete to a point just below the top layer of the reinforcing rods. 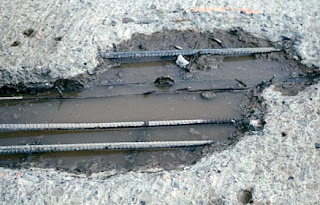 Once the damaged material is removed, then the new pour bonds to the underlying cement and the cleaned rebar. But the waterjets cannot read rulers either. So in early cases where the deck was more thoroughly damaged than the contractor knew at the time that the job began, the jet might remove all the damaged concrete, and this might mean the entire thickness of the bridge deck. And OOPS this could be very expensive in time and material to replace. What was therefore needed was a tool that still retained some of the advantages of the existing waterjet system, that it cut through weakened concrete, and cleaned the rebar without vibration, but that it did so with a more limited range, so that the depth of material removal could be controlled. There was an additional problem that also developed with the original concept. For though the jets removed damaged concrete well in this pressure range, the jets were characteristically quite large (about 0.04 inches or so). 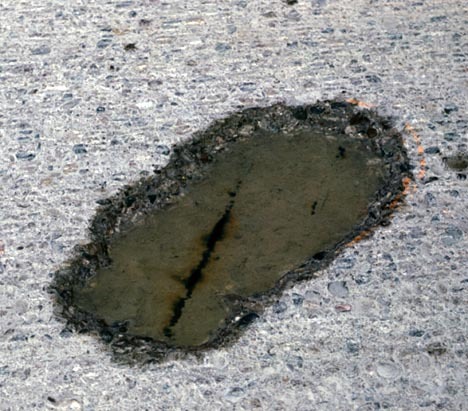 The damaged concrete is contaminated with grease and other deposits from the vehicles that passed over it. Thus any large volumes of cleaning water would also become contaminated, and, as a result will have to be collected and treated. That can be expensive, and so any way of reducing the water volume would be helpful. The answer to both problems was to use smaller jets at higher pressures. Because of the smaller size, their range is limited, and at the same time the amount of water involved can be dramatically reduced. It does mean that the jet is no longer as discriminatory between “good” concrete and “bad.” This is not, however, a totally bad thing, since when working to clean around the reinforcing rods, there has to be a large enough passage for the new fill to be able to easily spread into all the gaps and establish a good bond. 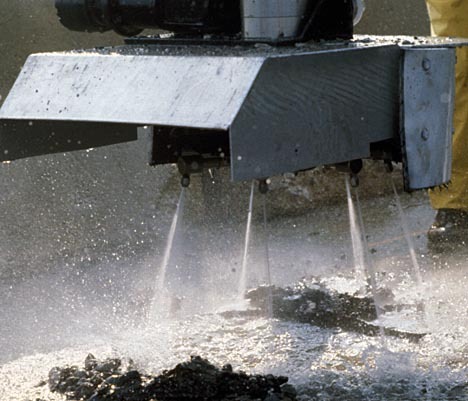 Thus the vast majority of concrete removal tools that are currently in use are operated at higher pressures, and lower flow rates. This allows the floor to be relatively evenly removed down to a designated depth, and this makes the quantification of the amount of material to be used in repair to be better estimated, and the costs of disposal of the spent fluid and material to be minimized. Figure 5. Scarified garage floor showing the rough underlying surface. This will give a good bond to the repair material, as will the cleaned rebar. The higher pressure system has the incidental advantage of reducing the back thrust on the cutting heads, so that the overall size of the equipment can be reduced, allowing repair in more confined conditions. Thank you very much for you kind information. Thanks for sharing the useful information. Its really a good blog. Thank you for the inspiration. This article is very helpful and informative. You can also use water blaster to help you cleaning faster.